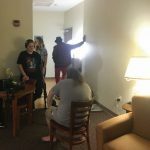 Behind the doors of a West Village apartment, as music played in the background, members of Press Play Productions gathered — chatting, joking, socializing — as they waited to begin filming their next shot. To someone who didn’t know any better, the atmosphere would have seemed more like a group of friends hanging out and having fun rather than members of a short-filmmaking club in the midst of a six-hour long shooting session. The friendly, easy-going environment maintained by co-Presidents Peter Gillette and Hao Ho, both junior filmmaking majors, is nothing new to Press Play Productions. Gillette noted the way in which former president and recent graduate Lauren Cristadoro invited him, Ho and others into the club, and wanted to replicate it for current and future members. The sole common denominator that joins together the members of Press Play Productions is the desire to be involved in filmmaking. Beyond that, there are no limitations as to who can join or what they can do. Experience level is also not something of concern to Ho and Gillette, as the latter expressed that “none at all” is required to join the club. According to Ho, Press Play Productions has typically produced one short film per semester, but they are aiming for two this fall — “Misguided,” which they are working on currently, and “Night Talks,” which will be their second of the semester. “Misguided” was dubbed “more ambitious” than any of the club’s previous works by Gillette. Ho added that, in the past, the short films ranged in genre from dramas to comedy skits, but the main focus within the past few years has been on dramas — and it’s paid off. “Words Unsaid” was produced in Fall 2017 and received an award in March 2018. Awards are satisfying, but the co-presidents said Press Play Productions has given them much more. Along with having acquired “a lot of connections and leadership skills,” Ho said he has learned how to edit film. Gillette’s answer closely mirrored that of Ho’s. Freshman TV, film and radio major Danny Allen Jr., who has prior experience within the filmmaking field, joined Press Play Productions looking to attain what Gillette and Ho already had. If interested in joining, students can email Gillette or Ho at gillettep@rider.edu or hohao@rider.edu. Meetings are held every Wednesday at 9 p.m. in Fine Arts 223.